specific works of literature are often compelling. Her more recent work flounders in some dodgy political waters, but her early books, especially Powers of Horror and Black Sun, create a fascinating poetics of the feminine. Definitely not for beginners. Go to Moi (1985) first if it’s all too frightening. Lane, C. (ed.) The Psychoanalysis of Race (1998), New York: Columbia University Press. This collection contains a good introduction by Lane and many interesting essays exploring the intersection of race and psychoanalysis in subjects from Julia Kristeva to W.E.B. Dubois. It also boasts Slavoj Žižek’s wonderfully entitled ‘Love thy Neighbor? No, thanks!’ Lebeau, V. Psychoanalysis and Cinema: The Play of Shadows (2001), London: Wallflower Press. A short but compelling exploration of the intertwined historical development of cinema and psychoanalysis, through their shared interest in dreams, desires, images and shocks, amongst other topics. Meltzer, F. (ed.) The Trial(s) of Psychoanalysis (1988), Chicago: University of Chicago Press. This excellent collection contains Stanley Fish’s entertaining and brutal, yet thought-provoking, attack on Freud’s rhetoric, ‘Withholding the Missing Portion’, Peter Brooks’s useful article ‘The Idea of a Psychoanalytic Literary Criticism’ and Arnold I. Davidson’s fantastic Foucauldian reading of Freud’s Three Essays on the Theory of Sexuality. Mitchell, J. Psychoanalysis and Feminism (1974), New York: Pantheon. Mitchell’s important book began the reclaiming of psychoanalysis for feminism in England. Mitchell, J. and Rose, J., introductions to J. Lacan Feminine Sexuality: Jacques Lacan and the École freudienne (1985), New York: Norton. Mitchell’s and Rose’s separate introductions to this collection of writings of Lacan on women are invaluable for charting the relationship between Freud’s and Lacan’s ideas about sexuality. Moi, T. Sexual/Textual Politics: Feminist Literary Theory (1985), London: Methuen. Although now somewhat dated in terms of recent developments in feminism, this book is still the best starting point for understanding the arguments between Anglo- American and French feminism, and how psychoanalysis fits into those debates. Mulvey, L. Visual and other Pleasures (1989), Basingstoke: Macmillan. Mulvey’s influential 1975 article ‘Visual Pleasure and Narrative Cinema’, included in this collection, began a new discussion about the ‘gaze’ and sexual difference in film theory. Phillips, A. On Kissing, Tickling and being Bored (1993), Cambridge MA: Harvard University Press. Phillips’s short articles on psychoanalysis (in this and the next two books) are compulsively readable and extremely entertaining. A practising analyst himself, his work is committed to making complicated analytic ideas accessible and connected with real life. ————On Flirtation (1994), London: Faber. ————Promises, Promises (2000), London: Faber. Rose. J. Sexuality in the Field of Vision (1986), London: Verso. This collection of Rose’s articles contains difficult but excellent explanations of the importance of Lacan to feminism and to theories of the visual, as well as interesting feminist psychoanalytic readings of George Eliot and Hamlet. ————The Haunting of Sylvia Plath (1991), London: Virago. A brilliant example of how psychoanalytic reading can yield rich literary results in the case of a single author. ————Why War? Psychoanalysis, Politics and the Return to Melanie Klein (1993), Oxford: Blackwell. Rose’s work (in this and the next two books) continues to explore the intersections of psychoanalysis, politics and culture. Much of her recent work has been devoted to Zionism and the Israel–Palestine conflict. ————On Not Being Able to Sleep: Psychoanalysis and the Modern World (2003), London: Chatto & Windus. ——————The Last Resistance (2007), London: Verso. Royle, N. The Uncanny (2003), Manchester: Manchester University Press. 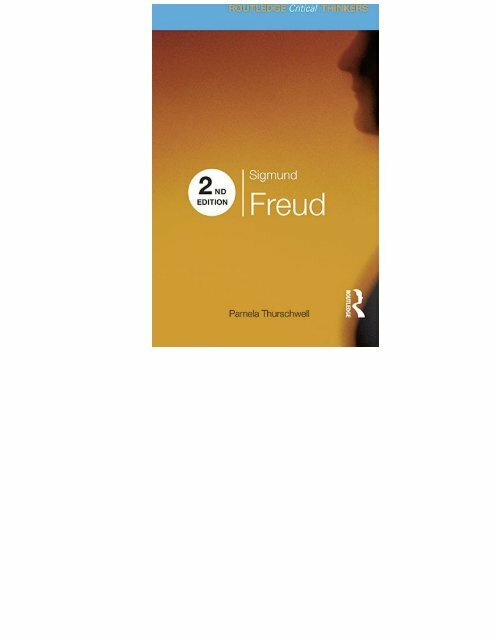 A fantastic spinning out of Freud’s marvellous essay on the uncanny in all sorts of fun and provocative directions from Shakespeare to Dickens to Dostoevsky to Derrida. A big book but easy to dip into. Sedgwick, E.K. Between Men: English Literature and Male Homosocial Desire (1985), New York: Columbia University Press. ————The Epistemology of the Closet (1990), London: Penguin. In this and the preceding book Sedgwick uses and critiques psychoanalysis’s analyses of homosexuality to argue for the central importance of the homo/hetero binary to understanding Western culture. If you are intrigued by the idea of queer theory the chapter in Epistemology of the Closet entitled ‘Axiomatic’ will take your breath away. Showalter, E. The Female Malady: Women, Madness, and English Culture, 1830– 1980 (1985), New York: Penguin. Showalter’s work on nineteenth-century women and madness seems a bit dated now, but it is still a useful starting point for thinking about the cultural context from which Freud’s ideas about women emerge. Vice, S. (ed.) Psychoanalytic Criticism: A Reader (1996), Cambridge: Polity Press. This is a useful collection which juxtaposes psychoanalytic articles of general interest with specific psychoanalytic readings of texts such as Virginia Woolf ’s Mrs Dalloway and Toni Morrison’s Beloved. It contains extracts from several classic essays, including Shoshona Felman’s article on Henry James, ‘Turning the Screw of Interpretation’, and Peter Brooks’s ‘Freud’s Masterplot’. Be aware of the limitations of extracted essays, however. Warner, M. ‘Homo-narcissism: or, Heterosexuality’ in J. Boone and M. Cadden (eds), Engendering Men: The Question of Male Feminist Criticism (1990), London: Routledge. Warner’s article criticises Freud’s linking of narcissism with homosexuality and shows the ways in which this perception of homosexuality underpins modern notions of heterosexuality. Wright, E. Psychoanalytic Criticism: Theory in Practice (1984), London: Methuen. Wright’s book is densely written, but helpful for tracing the history of psychoanalytic criticism after Freud but before the current climate. Žižek, S. The Sublime Object of Ideology (1989), London: Verso. The versatile and entertaining cultural and political critic Žižek has written many books which highlight his particular blend of Marx, Lacan and popular culture but this early one is one of his best. He jumps from Jewish jokes to Kant to Hitchcock to Tom and Jerry in an arresting display of the ways in which psychoanalysis can contribute to political and philosophical analyses of the contemporary world.